King Maha Tine San Dra founded the capital of Vesali in AD 327. The name of Maha Taing San Dra was written as the name of Dwe San Dra in Anandachandra stone inscription pillar. The chief queen of king Maha Tine San Dra was Thu Pa Bar Day Wi, the descendant of Tharkiwan clan of Kapilawat kingdom. The chief queen spoke to the king humbly that she wanted to worship Thakkyamuni Buddha image worshipped by descendants of Tharkiwon clan in Kapilawat kingdom. The king sent the ministers and the high officers to Kapilawant kingdom to covery Thakkyamuni Buddha image. They conveyed the Buddha image in the sailing ship. When they reached Theinseetauntwaykhanaung, the Buddha image fell into the water as the ship wrecked due to breaking out of the storm there. Although they looked for it in the water, they didn’t find it because the water was very deep. When the ministers and the high officers got back to the palace, they spoke to the king humbly that the Buddha image had fallen into the water. When the queen Thu Pa Bar Day Wi heard that news, she was contracted with the mental illness because her wish didn’t come true. 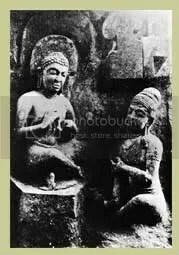 And then, the Buddha image was made of single stone by the king in AD 327 and he let his wife worship the Buddha image instead of Thakkyanmuni Buddha image. But, the queen made a solemn wish donating light and flowers to Buddha image. She prayed to Buddha image, “Although I cannot worship Thakkyamuni Buddha image of my country in this existence, may I worship it as soon as I am born as a princess in the next life.” The queen was reincarnated as the princess of king Min Ra Zar Gyi and queen Shin Ma Hnaung after she had been dead. As soon as the princess had been born, she was able to worship Thakkyamuni Buddha image by finding it in the water. The Buddha image erected by king Tine San Dra in Vesali, was called Vesali Sutaungpyit Buddha image as the Buddha image fulfilled the queen’s wish. In the ancient time, the image was woshipped by placing it in the stone cave. But the cave had already ruined. The prayer hall was built of bricks in the east outside the perfumed chamber. Two Buddha images in the prayer hall, are Buddha images taken from Shwetaung pagoda and Ngwetaung pagoda. The perfumed chamber and the prayer hall are fenced with the wall. There are entrances in the south and the east. The Buddha images is in the form of sitting on the lotus throne. The images is 17 feet high. The pagoda board of trustee takes care of it.